Did you know that there’s a way to learn a new language while simultaneously benefiting the world by increasing global access to knowledge? Well there is, dear reader, and you need only read on to join the revolution. About a year ago I came to a very interesting conclusion: those speaking the English language have easy access to more knowledge than any other group in the world. Why is this? Because of Wikipedia. 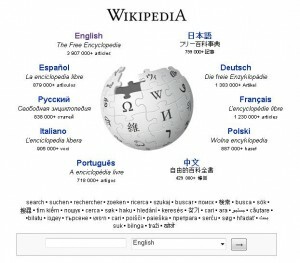 Wikipedia has exploded in popularity since its launch in 2001. Indeed, it’s hard for many to even remember what things were like before wikipedia. As one friend put it: “where did we go to look stuff up?” Wikipedia is so omnipresent today that it has become the one-stop-shop of choice for most factual referencing in our society (or at least the ‘first-stop-shop’). However, when you head over to wikipedia.org, you are greeted with the realization that this knowledge is not equitably available. Although the English site has nearly 4 million articles, other languages fall far in arrears. After English, the next highest total is German (1.4 million), followed by French (1.2 million). English is in the lead by a factor of three! Other languages available, including Russian, Polish, Arabic, Mandarin, Portuguese, Catalan and Esperanto fall much, much farther behind. So what can we do about it? Translating 4 million pages of often highly technical description into dozens or even hundreds of languages is a daunting task. Enter Dr. Luis von Ahn, a genius from Guatemala city, Guatemala (can you tell that I’m a fan?). Dr. von Ahn began to think about a way to convince millions of volunteers, all with their own language histories and preferences, to do the translation work for him. This type of approach is known as ‘crowdsourcing’, in other words tricking the masses into doing simple jobs that would take a smaller group an unreasonable length of time. What Dr. von Ahn came up with for translating the web with is called Duolingo. Duolingo is simultaneously an online translation service and a language learning tool. This is how it works: you select the language you wish to learn. Duolingo will then feed you a combination of standard language teaching materials and snippets extracted from wikipedia. As you work on your translation skills and learn new words, you are translating wikipedia one sentence at a time. To ensure clean translation, Duolingo will cross-reference your answers with that of many other users doing the same thing, coming up with a best estimate of the actual translation. Duolingo also sends the more complex sentences to the most advanced users. In return, users get access to an engaging and free language-learning software. The website launched in November of this year, with German and Spanish-language courses available. The developers aim to eventually include Mandarin, Italian and French. If that is successful, the sky’s the limit! Maybe one day we’ll be seeing Tagalog wikipedia! I signed up as a Beta tester last year and have been using Duolingo since November. I’ve found it easy to use, fun and similar in layout to Rosetta Stone, the popular (but expensive!) classic alternative. But Rosetta Stone doesn’t help give Spanish-speakers access to the wealth of knowledge on the internet! If you’re interested in learning some Spanish or German I highly recommend you head on over to Duolingo.com and sign up for the waiting list for an account. Do it for yourself and for the world! Published by erik on 2012/04/10 at 2:02 AM under General Discussions. Great deⅼіvery. Outstanding arguments. Keep up the amazing spirit.